NEWARK, Del. 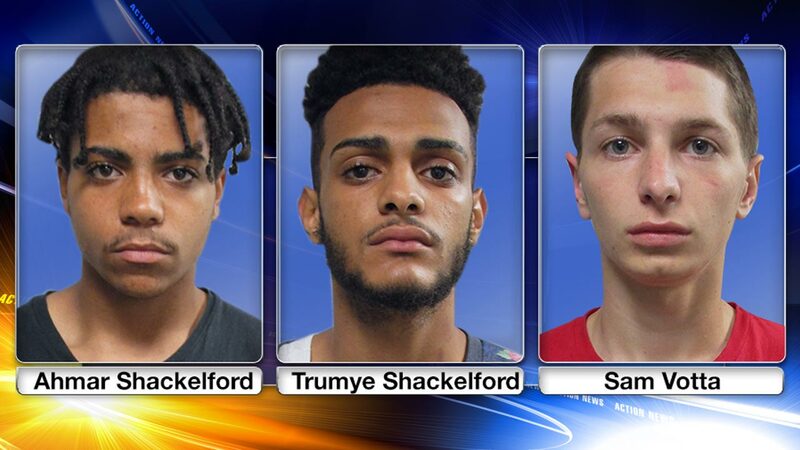 (WPVI) -- Police quickly arrested three teens following the robbery of a University of Delaware student early Sunday morning. The 21-year-old male student told police he was walking along Lovett Avenue in Newark around 2:30 a.m. when he was cut off by the driver of a black, older model sports car. Two passengers then got out and told him to empty his pockets, police say. One suspect reportedly had his hand in a pocket in an apparent attempt to appear he was armed with a gun. However, during the confrontation, a University of Delaware police officer turned the corner and the suspects fled. The student flagged down the officer, who reported the attempted robbery. Another officer stopped the vehicle on E. Delaware Avenue and Academy Street. The driver and the two passengers were arrested. They are identified as: 18-year-old Trumye Shackelford, 17-year-old Ahmar Shackelford, and 17-year-old Sam Votta. All three have been released on unsecured bond.